When both my grandmother and my fiancé's mother were in the hospital, I spent the days going from one rehab to another. I was operating on very little sleep and Christmas was approaching. While out doing errands, I had a bag of clothes to drop off in a donation bin. As I pulled into the parking lot, my eyes were filled with tears. I didn't know how much more I could take. I broke down and asked God for help. I asked the angels to give me the strength I needed. I didn't want to lose my Nana or my fiancé's mother. I had loads to do before Christmas and I was spent. As I lugged the heavy bag of clothes from my trunk and carried it to the dumpster, I noticed something on top of the handle. 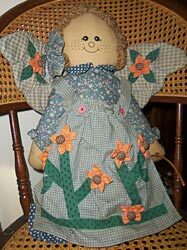 It was the cutest stuffed angel doll--made with patchwork wings, a smiling face, yarn hair and a dress. I couldn't believe it. Who would leave such an adorable angel on a dumpster? Why? I gently took her from the handle, opened the bin and donated my clothes. After getting into my warm car, I placed the angel doll on the passenger seat. Then, it hit me. I got my sign from the angels. I felt a warmth inside and smiled as I felt the love and support I needed. The angels carried me through, and I still have the doll they left for me to find. I'll never let her go. 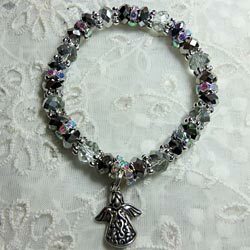 That day led to this story being published in a book, (a longer version), to starting Hope Angel Bracelets several years later, and to a constant feeling of love and support from the angels. Inspiration for Story: Finding an angel doll on a clothing donation dumpster gave me hope when I needed it most.